This is another in my occasional series in which I draw conclusions about business, technology and change from my experiences in various of the sports that I enjoy. The first article in this series was Perseverance, which compared the degree of effort required to succeed in rock climbing with that necessary in change management. Here I am going to focus on another of my pastimes, mountain biking. Mountain biking (invariably abbreviated to MTBing, with the bikes themselves called MTBs) is something that I have got into more recently than rock climbing, but I suppose there are some parallels between the two. My path into rock climbing started with loving walking in the outdoors, which became hill-walking, which became scrambling (hill-walking where you have to use your hands to get through steeper sections), which eventually became rock climbing. Starting at the same place, MTBing is another logical progression from general and hill-walking. While rock climbing was about increasing the angle at which I moved (to vertical and then over-hanging), MTBing was about increasing my speed. Another thing that rock climbing and MTBing have in common is their adherents’ obsession with equipment. With rock climbing this ranges from the shoes you use, to bouldering mats, to ropes, to the various pieces of equipment that you use to protect yourself. With MTBing, the focus is mostly on the bike itself. 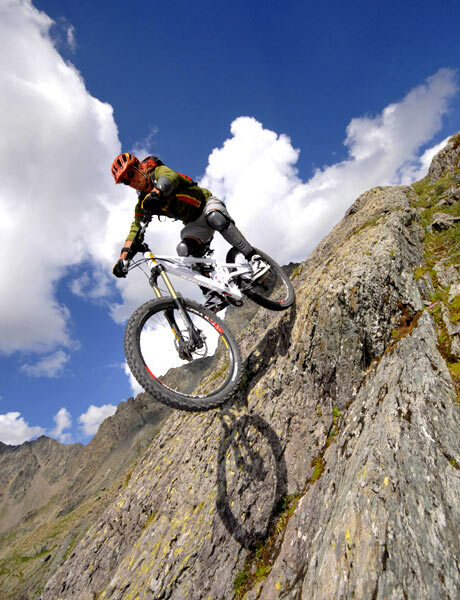 There are two main types of mountain bikes: hard tails and full suspension bikes. Hard tails have a shock absorber at the front, but the rear is essentially the same as in a road bike. An example of two hard tails appears below – these are actually my bike and my partner’s, both rather muddy from a day out. 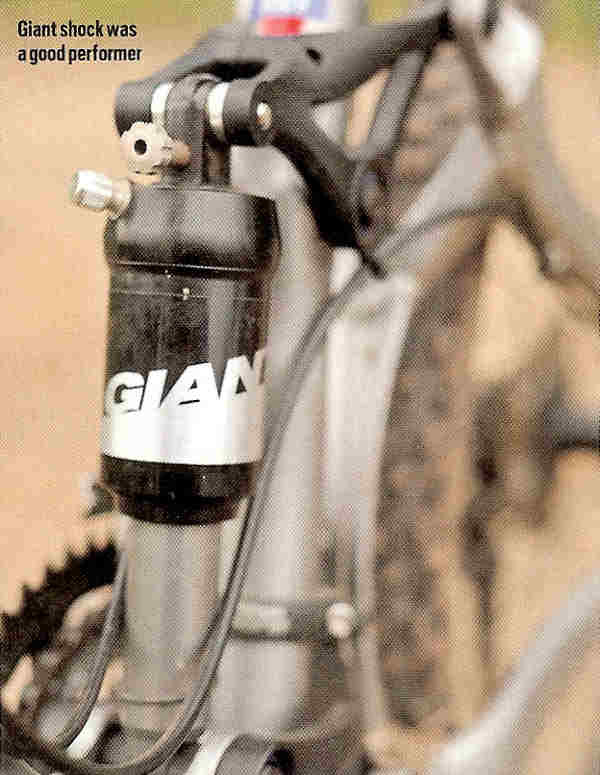 Full suspension bikes (as the name suggests) have suspension at both front and rear. The fact that you also need to drive the suspended rear wheel with the pedals makes these types of bikes much more complicated from an engineering perspective (and inevitably more expensive). While some zealots aver that all you ever really need is a hard tail, regardless of the conditions, the majority accept that a full suspension MTB will allow you to take on more challenging terrain with greater comfort and security. It is full suspension bikes that I will devote the rest of this article to. 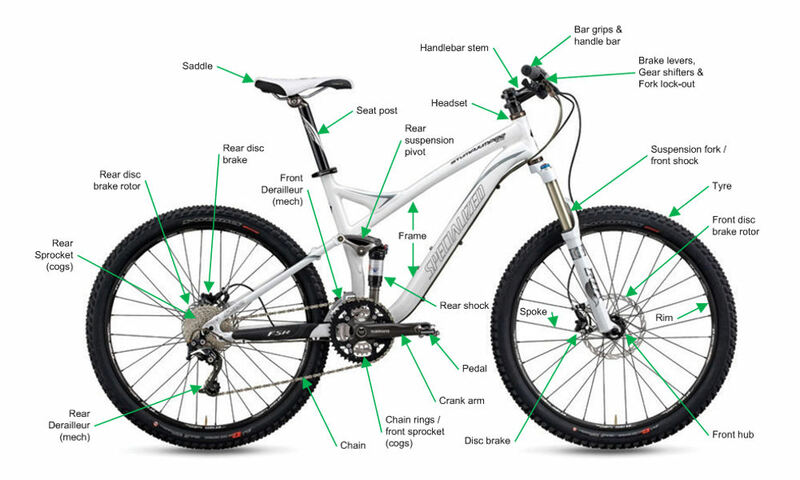 The following is a diagram showing the general anatomy of a full suspension bike; the UK version of a Specialized Stumpjumper FSR Elite (the US one currently being black). The image is copyright Specialized, one of the most well-know bike manufacturers, but the annotations are mine. As you might expect, one of the major factors influencing the performance of a MTB is the frame – this is the main structure of the bike, generally made from steel or alloy tubing, or sometimes carbon fibre in more expensive models. Helpfully in the diagram, the frame is essentially all the white bits. As we are talking about a full suspension bike, the back of the frame needs to flex in order to allow the rear wheel to move up and down. The above design is for a cross country bike. 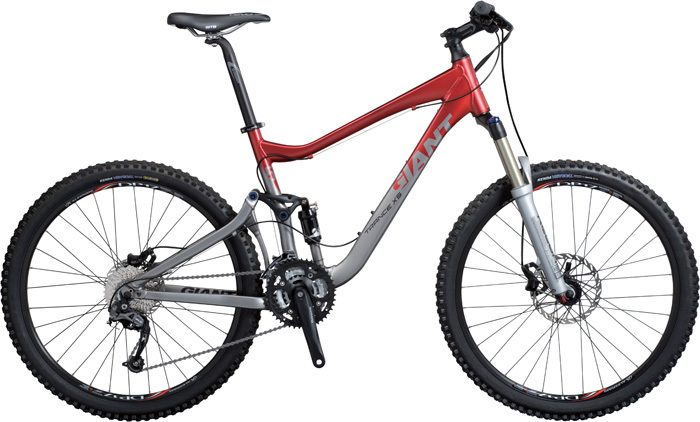 This is the least aggressive type of MTBing and consequently places least stress on the frame. In this bike, the seat and chain stays (the triangular white bits at the back extending back to meet at the axle of the rear wheel) are both pivoted and their movement is damped by the rear shock absorber. 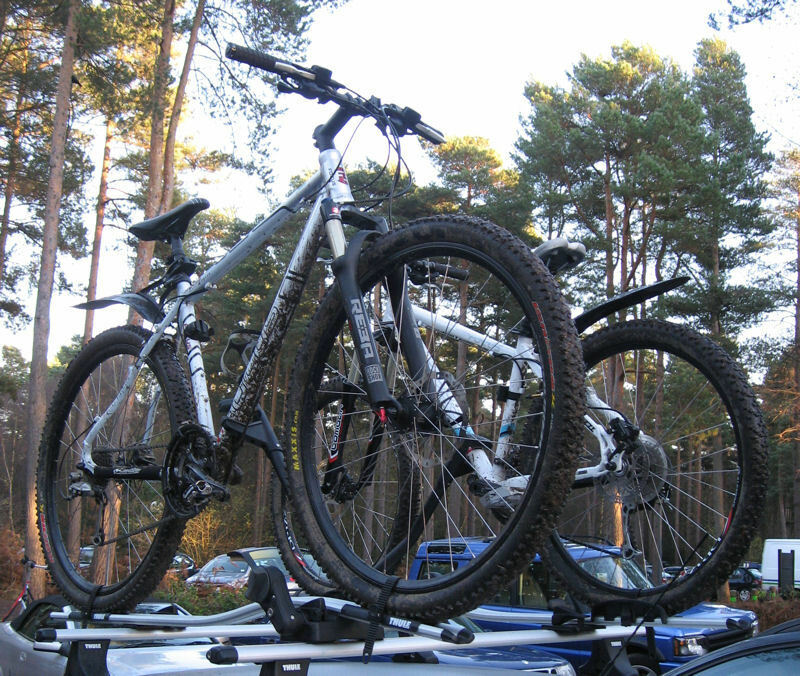 In more full-on types of mountain biking (all mountain, free ride and down hill) the bikes can begin to resemble tanks – think of a 4×4 (SUV) compared to a regular car. Designs with a single, beefy swing arm at the rear are more common in these types of bikes. However it is not the frame that I really want to focus on here, but the other components that go to make up the bike. Most of these are labelled in the diagram. Sometimes a bike comes complete with all of these and ready to ride. Other times you buy the frame only (or maybe the frame and shocks) and then add the other components that you would like to have. In this second approach the idea is to tailor the components to the type of riding that you want to do and of course to your wallet. It is also worth noting that Specialized, more than most other frame manufacturers, are known for producing their own components – they even make the shock absorbers for many of their models. On a bike from another company, the seat post, saddle, head stem, handle bars and tyres would all also be from another organisation; often different ones to those listed above. While, as mentioned above, the frame plays a very important role in determining how well a bike performs (and it is generally the most expensive part of the bike), what really leads to a great bike is how all of the different components are blended together. While Component A may be great on Frame X, working with Component B, it will be a much less good choice for Frame Y, working with Component C. The other factor that comes into this is of course cost and this makes a balance even harder to find. It is in the above area that I see some similarities with systems integration. Here too the aim is to make products from different organisations work in harmony in order to deliver the greatest level of effectiveness at the lowest cost. Here too trade-offs will be necessary to meet the often incompatible goals of performance/functionality and cost. In systems integration, as in MTBing above, Product A may work well with Product B in Industry X, but be a bad option to run with Product C in Industry Y. We found this presumably cheap own-brand unit to be the best we’ve ridden on a Maestro linkage [the type of rear pivot arrangement featured on the bike], whether by chance or design. It felt like it had less compression damping and married with the linkage better than any Fox unit we’ve tried. It was a lot more active, allowing the Maestro design to track the terrain better on this bike than on any other Giant Trance we’ve ridden previously. It is worth noting that MBR terminology can be just as confusing as IT jargon until you get used to it. The above quote is actually relatively light on terminology. While it is dangerous to extend some analogies too far, I think that there is something to be learnt here about how to run systems integration projects. It is the systems that work best with the other parts of the design that should be selected, not those that have the best features when considered in isolation, or those that come from the most prestigious companies. It used to be said that buying the products of some IT vendors was a sure way to avoid getting fired (the vendors mentioned have varied over time). The above insight from the world of mountain biking suggests that looking beyond the obvious (and often more expensive) products may sometimes yield significant benefits.